In this book, Kolman’s approach to music fundamentals is straight-forward, yet he manages to inject humor and lightness in an otherwise fairly dry subject. And here is what I think is key (no pun intended): it is the approach. There is a plethora of fundamentals books and methods available and almost all of them follow the same patterns. While not bad in and of itself, this traditional approach leaves something to be desired in maintaining interest for those who are genuinely curious but not prepared for the rigor and dryness of the subject. Koman succeeds reworking the traditional approach with a well written and clear method, peppered with humor and amusing asides. 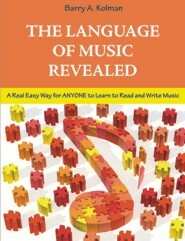 I feel that this book could very easily be used by the music lover who wishes to be musically literate, or adopted any music fundamentals course for music majors (as review), or, especially, the the non-music major at any college or university. This book presents a well-organized approach to understanding and applying basic music theory. It is thorough without becoming too weighty for beginners and reads in a light, humorous manner. The material is presented by a “Guide,” who leads the discussion and provides guidance in every aspect of the lessons. Assignments and correct answers are provided throughout the book. While some basic part writing and cadences are addressed, it is impossible to be thorough in the more advanced topics in one slim volume. The real strength of this text is the explanation of the basic fundamentals of music reading, making it possible for a teen or an adult beginner to prepare themselves to read music or take more advanced music theory courses. One of the challenges that has always faced Barry Kolman, professor of music at Washington and Lee University, is teaching the fundamentals of music theory to students who know nothing about music and often find it a very dry subject. >Read more.